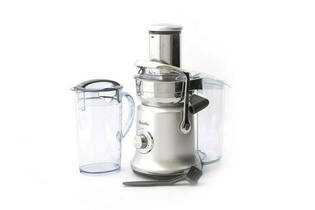 Snapshot: The Breville the Juice Fountain Cold XL BJE830SIL is a centrifugal juicer with three speeds. But how well does it juice? Very easy to assemble and take apart. Has cleaning brush, juice lid and juicing nozzle. Large bulky unit can be difficult to clean in the sink. Deep catchment area near spout traps some juice after processing. 2-year warranty, 5-year motor warranty.